Shoot rinkas and you'll get the point. Game Over : Life is 00. Pick up items and survive! Thanks : Kejardon, DC, Black Falcon, squishy_ichigo, Sadiztyk Fish, JAM, RaccoonSam, bibinber and others. Possibly the most unique hack in existence. 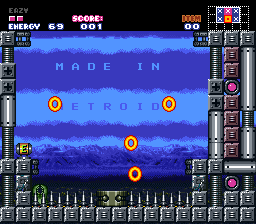 There's nothing quite like a Metroid arcade game. An excellent way to kill an hour. The only flaw is that one you've completed it once, there's little to no replayability. Still, I've gotten more enjoyment out of this silly little hack than out of the vast majority. Yes, you can beat this hack. It is so unique. You'd think a one room hack would be horrible in general, but not this hack. Even when locked in a 1x1 area this hack has tons of replay value. The three difficulty modes keep the challenge fresh once you master one of them. 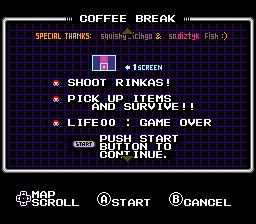 You win by killing rinkas and collecting the drops the give. But beware, its not as easy as it sounds. 1000 pts to win! A very unique and interesting display of ASM. For what it is, it's just so well done. If you haven't played this, you need to. Just play it. Go on, play it. More Items technically can be collected without major glitches. Not a bad quick hack, reminds me of an old arcade machine. Bored? just slot in your quarter and have a go at it.